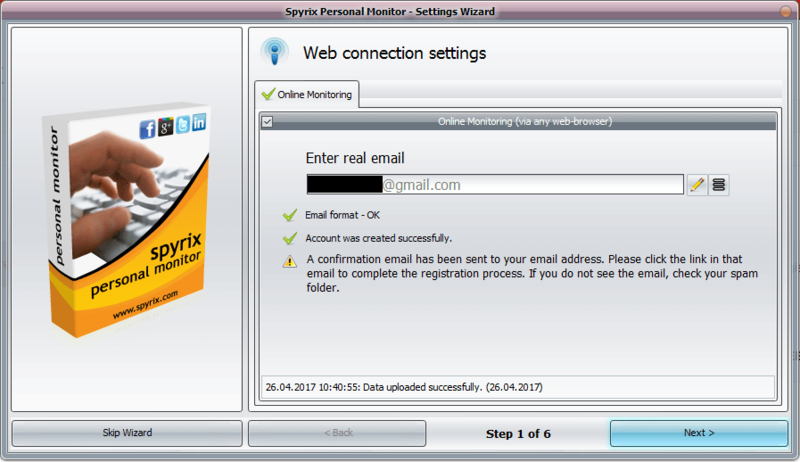 You can download any Spyrix program here at any time:: http://www.spyrix.com/download.php Choose a program and click on the “Download” button. 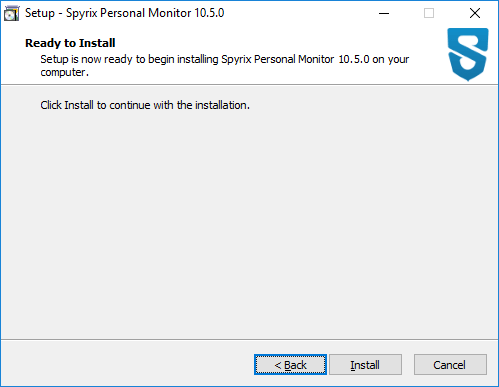 Click “Finish” to complete the installation. 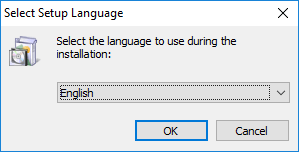 The program will launch automatically after that. 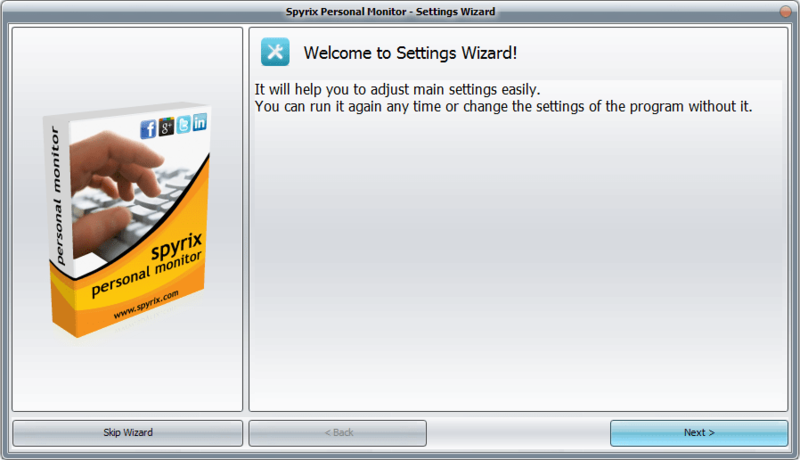 After the installation the program will launch the Settings Wizard. 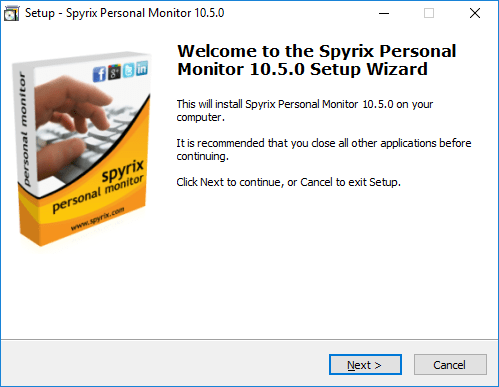 If you do not want to configure any settings you can “Skip Wizard”. 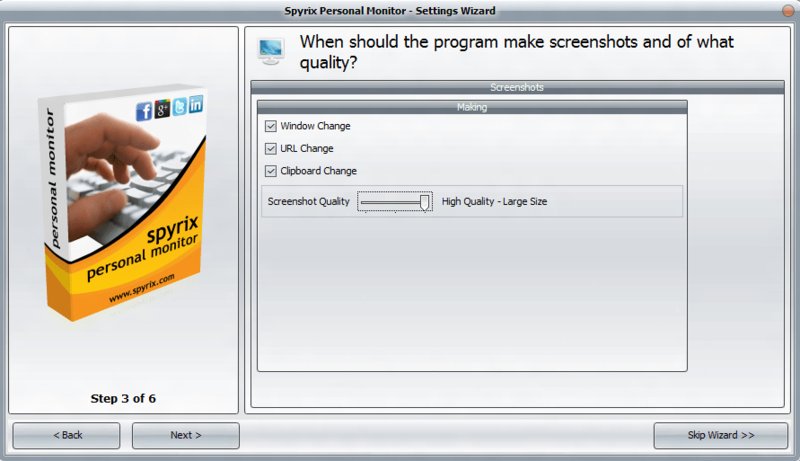 But it is strongly recommended not to skip it and configure all the settings. The configuration will take a couple of minutes. 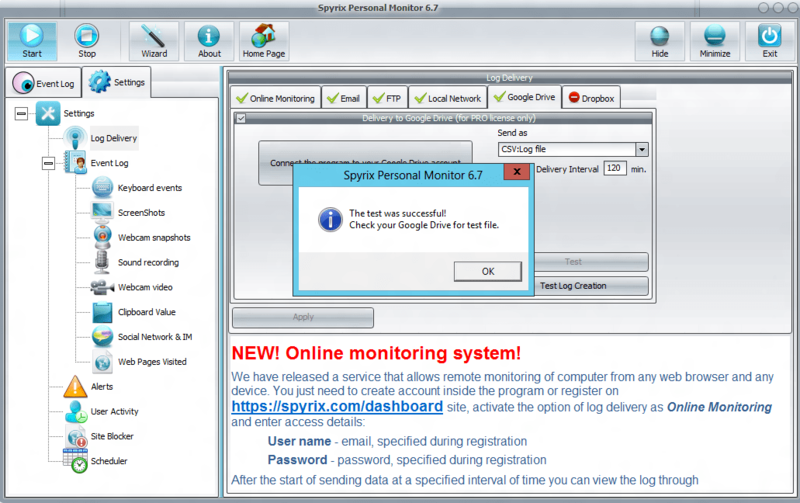 – Check the box next to “Online monitoring (via any web-browser)” to enable it. 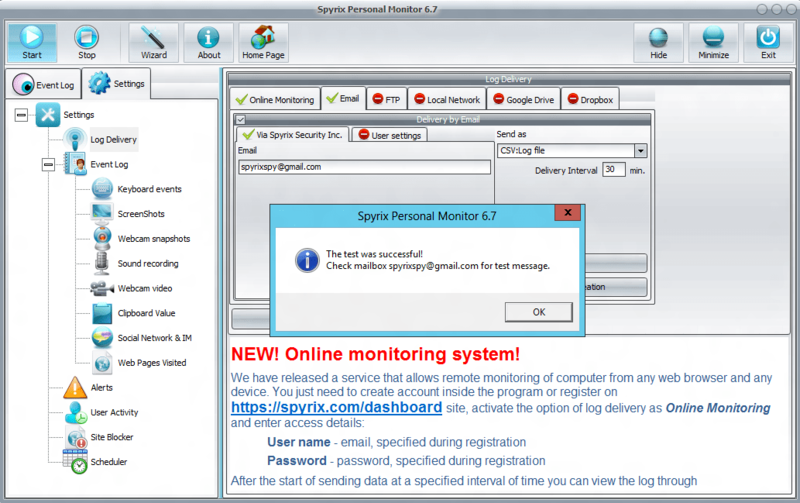 – Enter your email address, wait for the program to check it, and click “Next”. 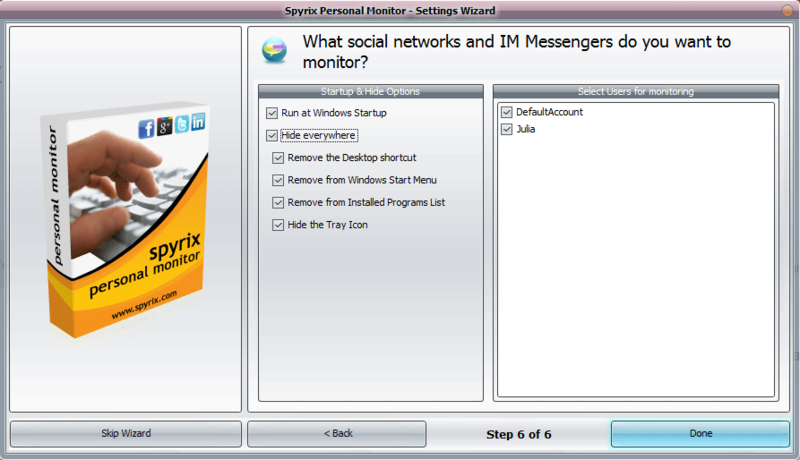 – A new window will open – click “Ok” to create your account. 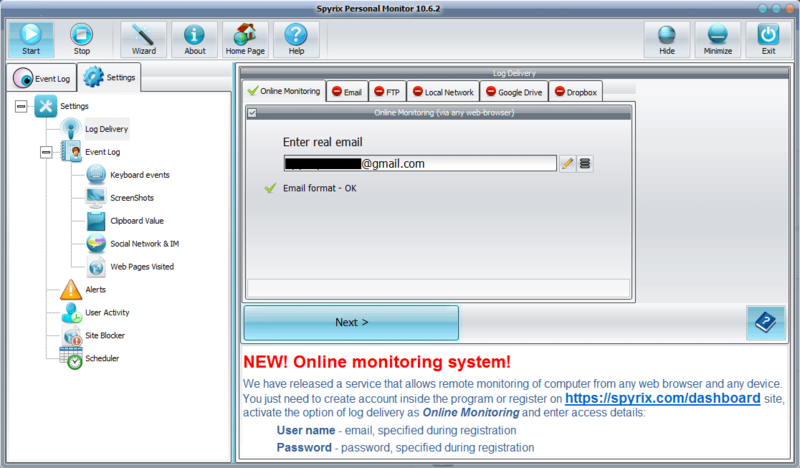 – Now you need to go to your email and and activate your account. 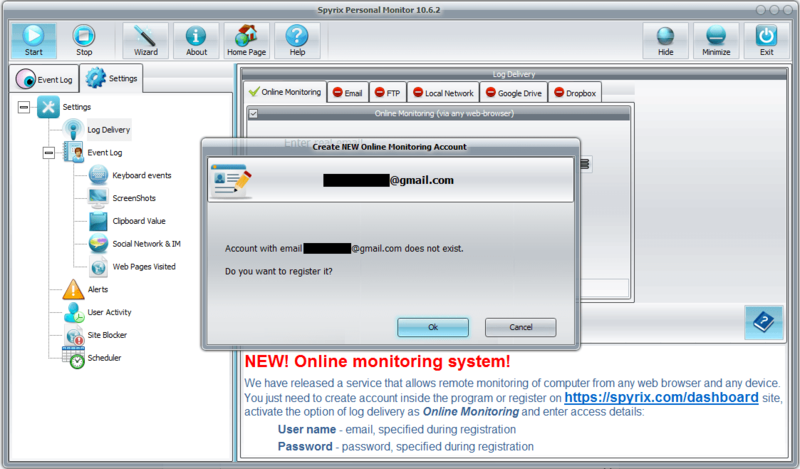 – When you click the account activation link you need to set up your account password to log in. 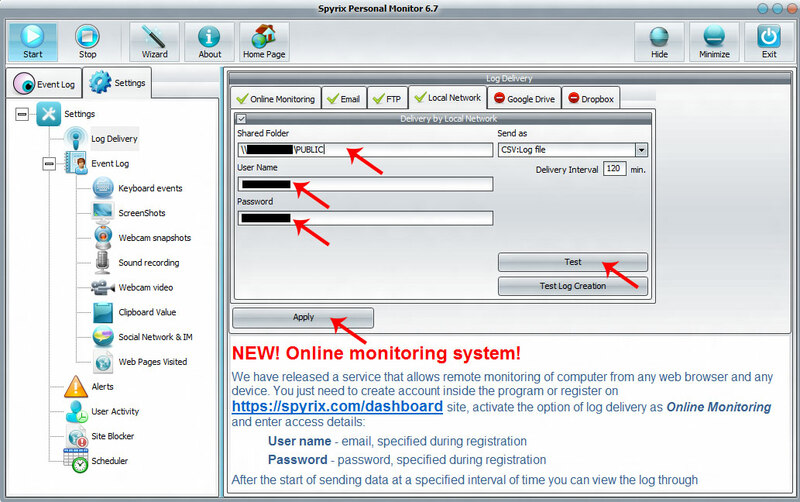 – In a couple of moments you will receive first data in your account. – Click “Next” to go to Step 2 in the Wizard. 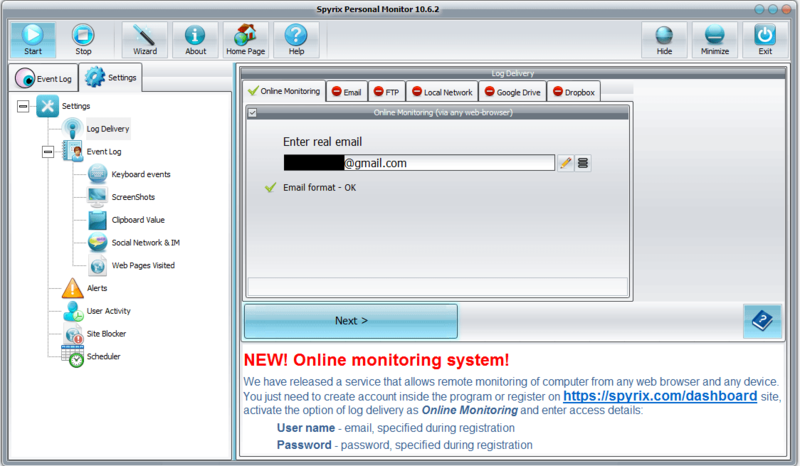 – Enter your account email address, wait for the program to check it, and click “Next”. 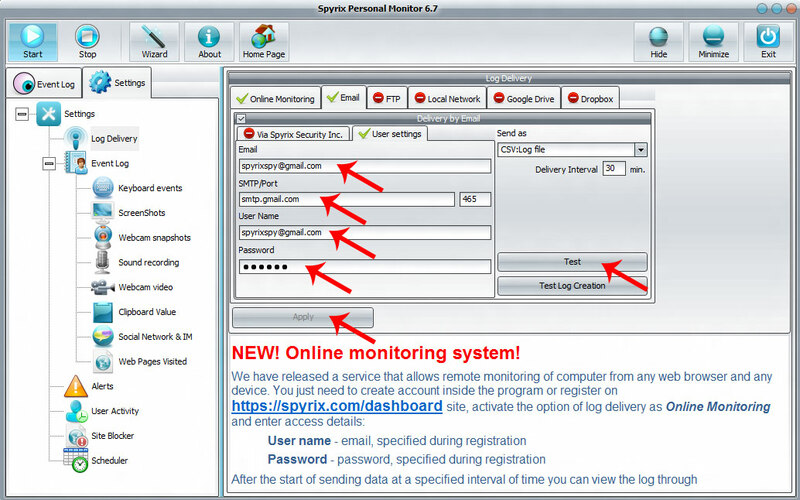 – In a couple of minutes you will receive first data in your account. 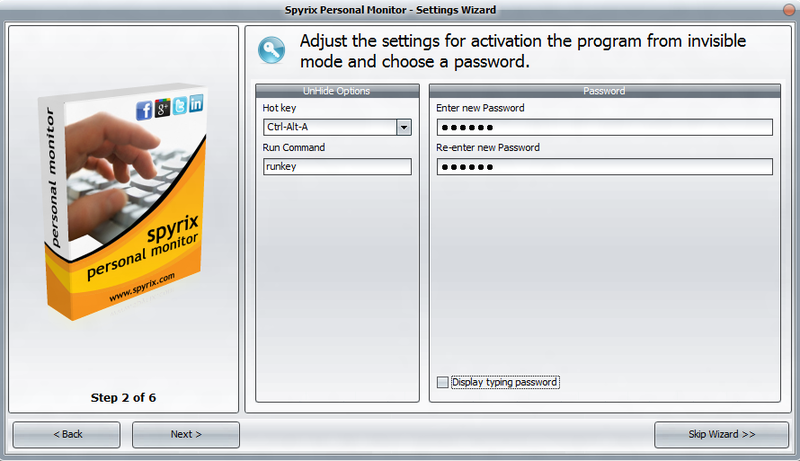 Choose the Hotkeys to bring the program up from the hidden mode (or leave them by default) and create a password to activate the program (not necessary). Set the quality of screenshots and choose when they should be made. Choose categories or certain websites to be blocked (not necessary). 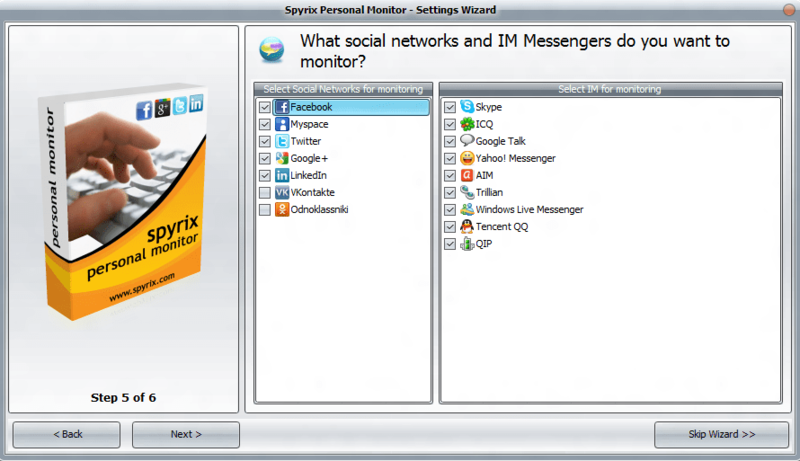 Choose social networks and messengers that you want to monitor. 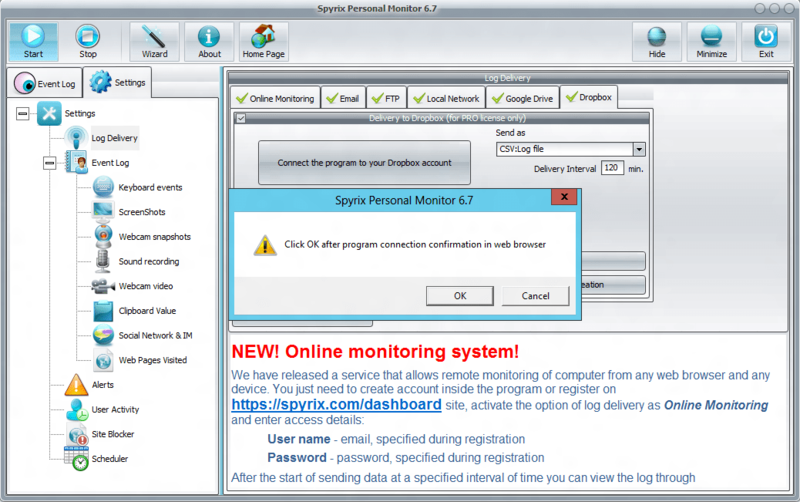 Choose if and how the program will be hidden on the target computer. 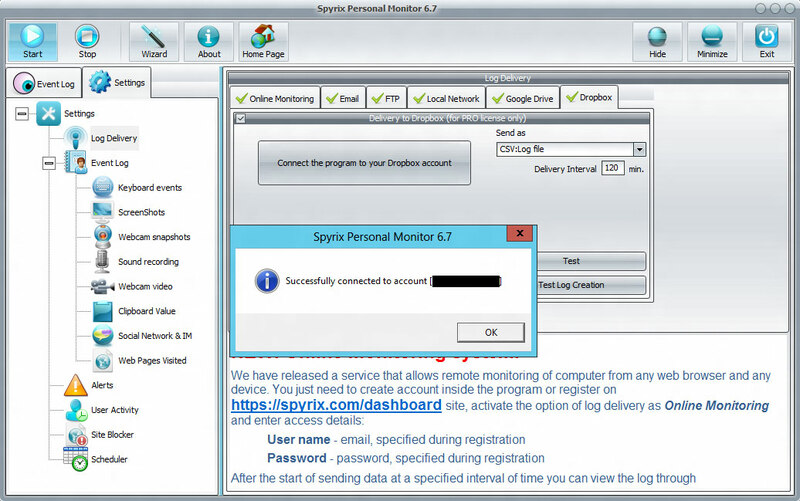 Also check all users you want to monitor. 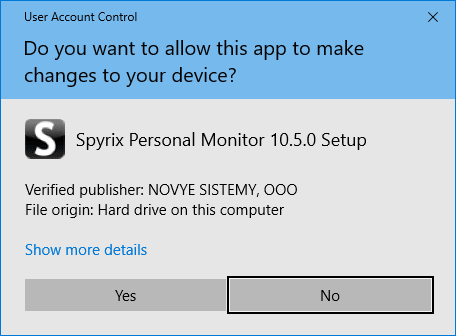 If you want the program to run automatically, leave “Start at Windows startup” box checked. 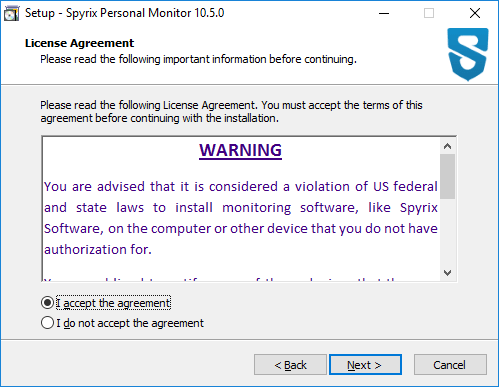 To register your license, click on the “About” button in the program. 1. 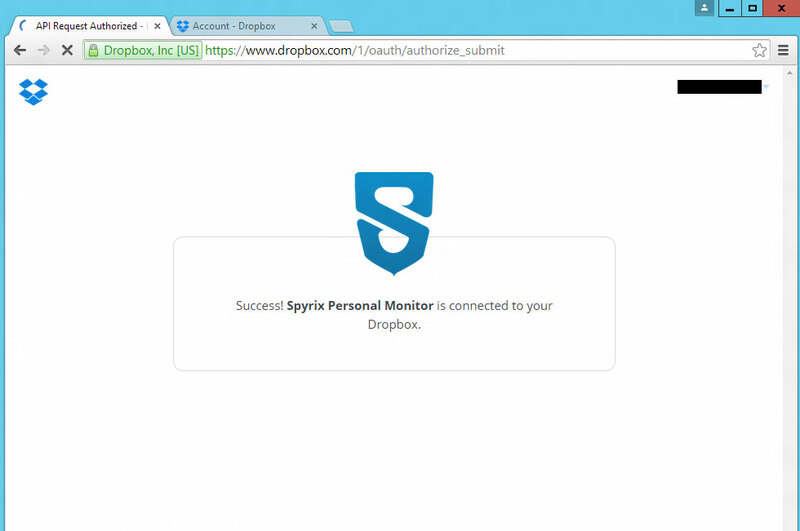 Enter your online dashboard, click your email in the top right corner of the screen and select “Account” in the drop-down menu. 2. 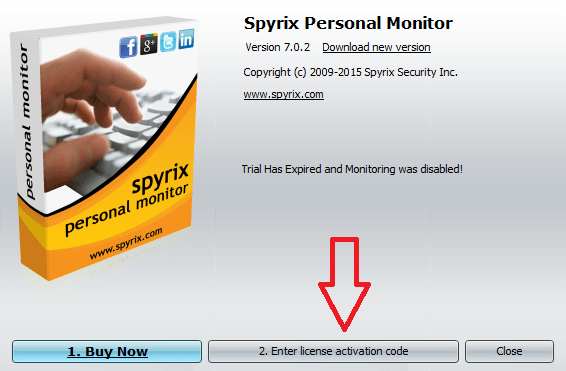 Enter your license type and license code and click “Register”. 2. 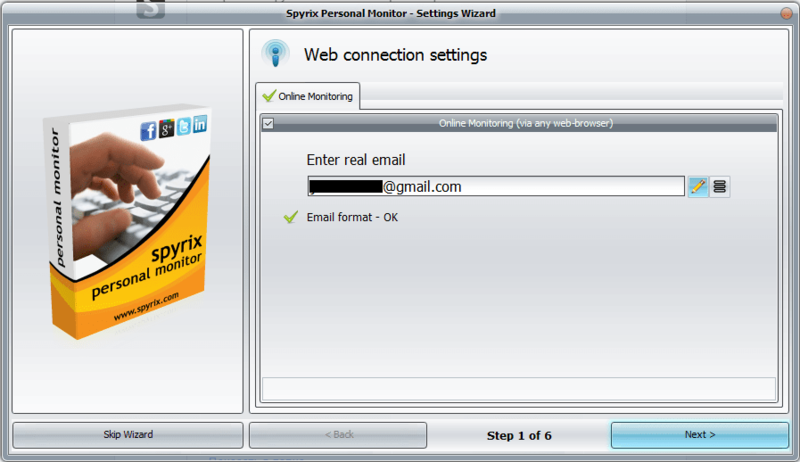 Check the box next to “Online monitoring (via any web-browser)” to enable it. 3. Enter your email address, wait for the program to check it, and click “Next”. 4. A new window will open – click “Ok” to create your account. 6. 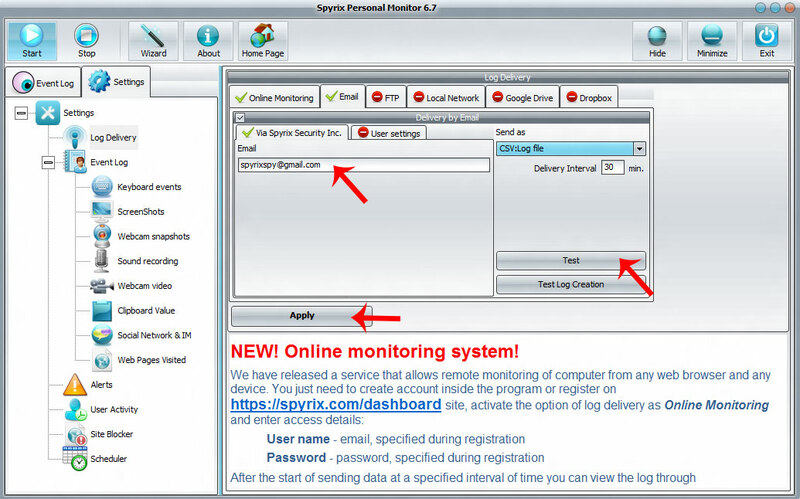 Now you need to go to your email and and activate your account. 7. When you click the account activation link you need to set up your account password to log in. 8. In a couple of moments you will receive first data in your account. 3. 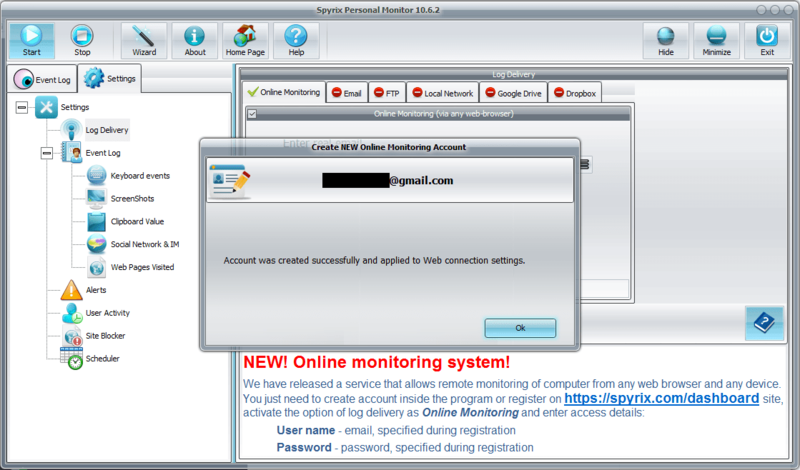 Enter your account email address, wait for the program to check it, and click “Next”. 5. 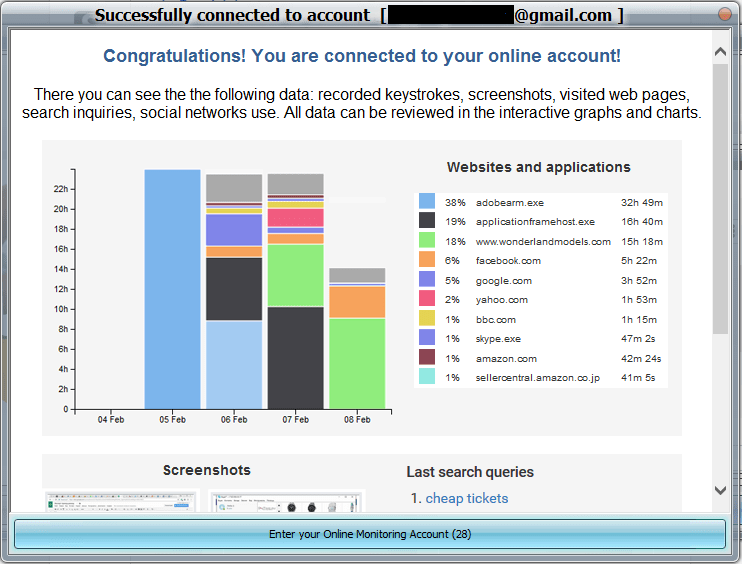 In a couple of minutes you will receive first data in your account. 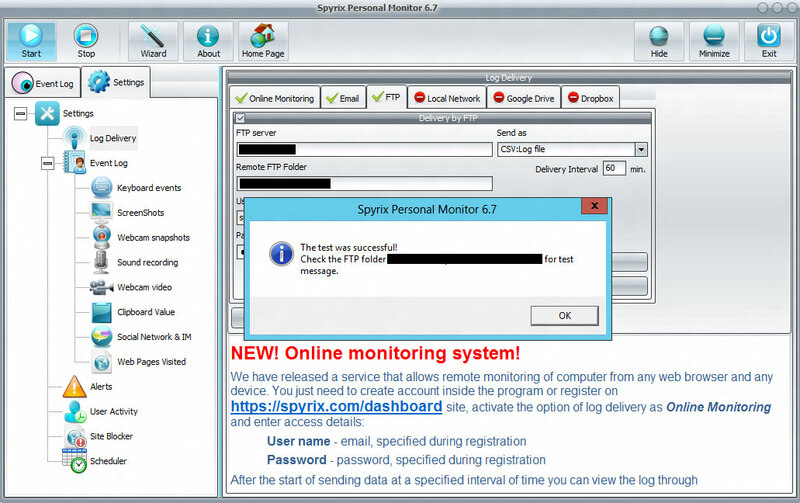 Choose FTP tab and place a tick near Delivery by FTP. 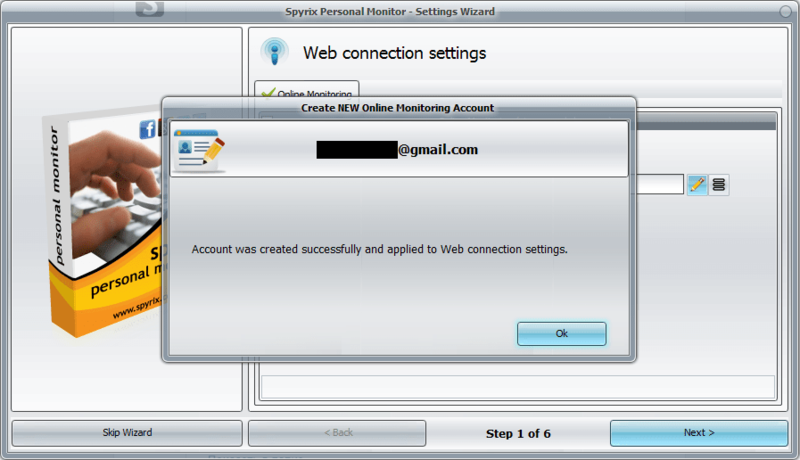 Then you need to fill FTP server, Remote FTP Folder, User Name and Password fields. 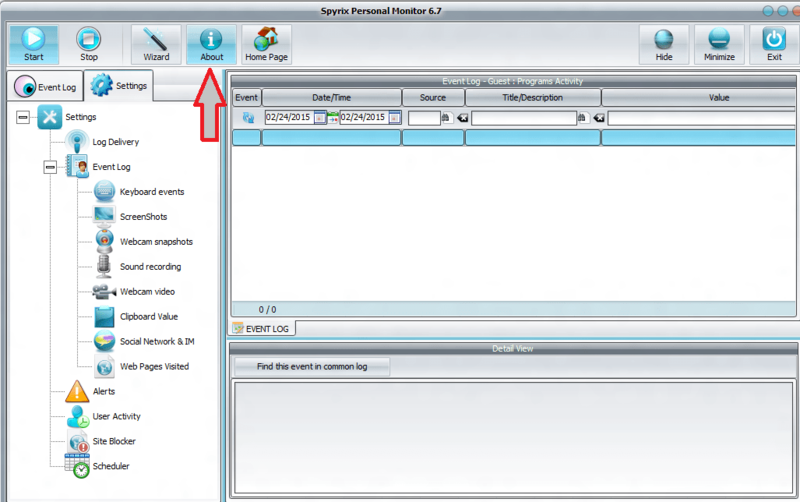 If you’ve done everything correctly, you will see a message about successful sending of test message to your folder via FTP. 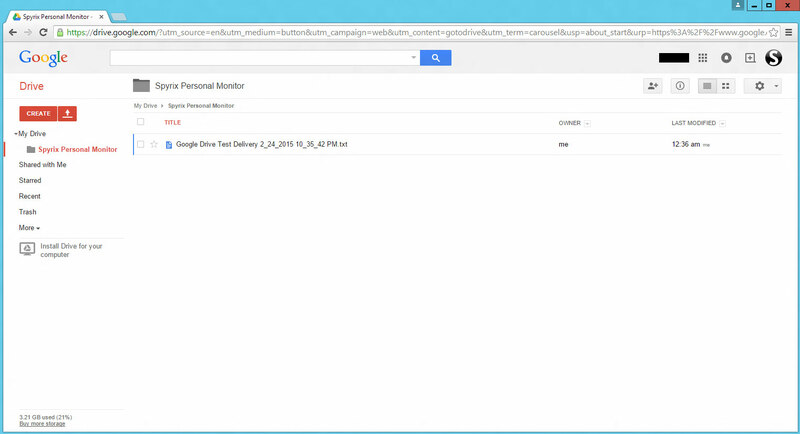 Choose Local Network tab and place a tick near Delivery by Local Network. 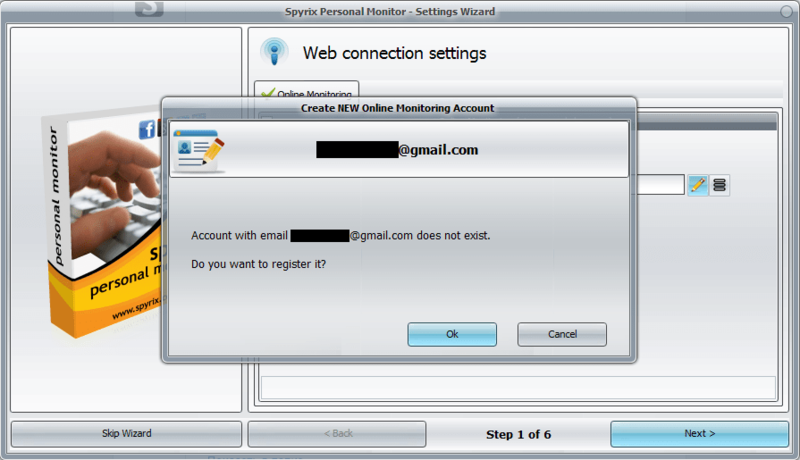 Then you need to fill Shared Folder, User Name and Password fields. 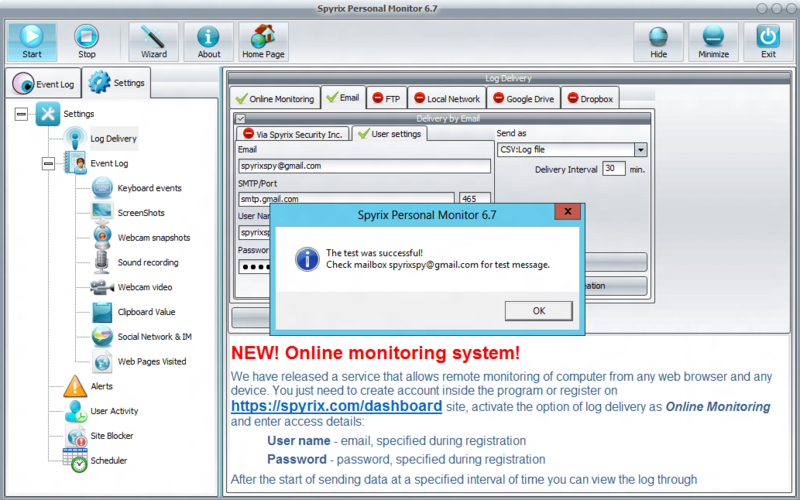 If you’ve done everything correctly, you will see a message about successful sending of test message to your folder in local network. Choose Google Drive tab and place a tick near Delivery to Google Drive. 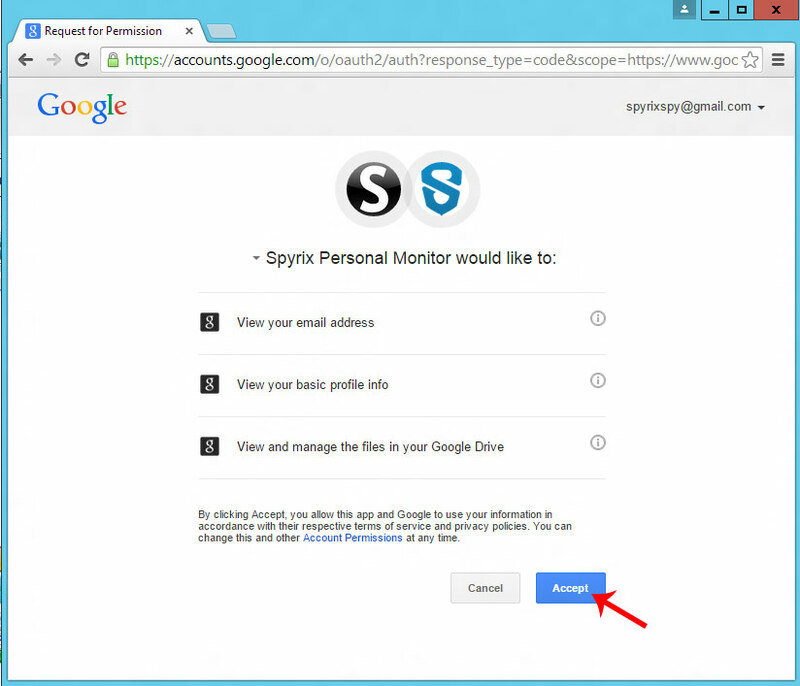 A browser will open and ask you to enter your Google account. If you’ve done everything correctly, you will see a message about successful connection with your Google account. 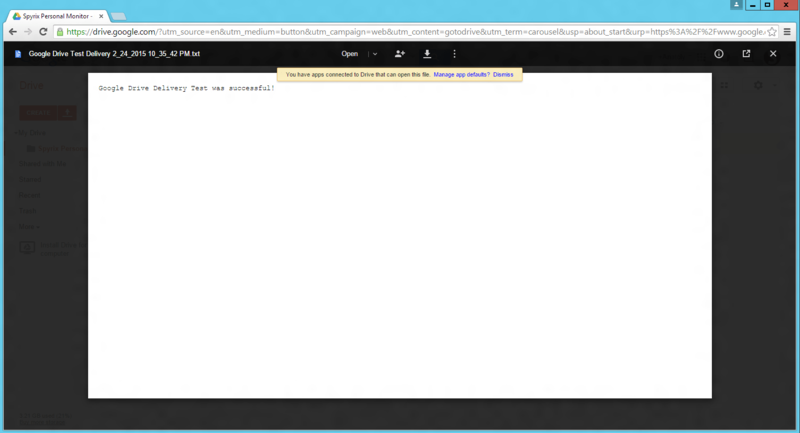 Then press “Test” and you will see a message about successful sending of test message to your Google Drive account. 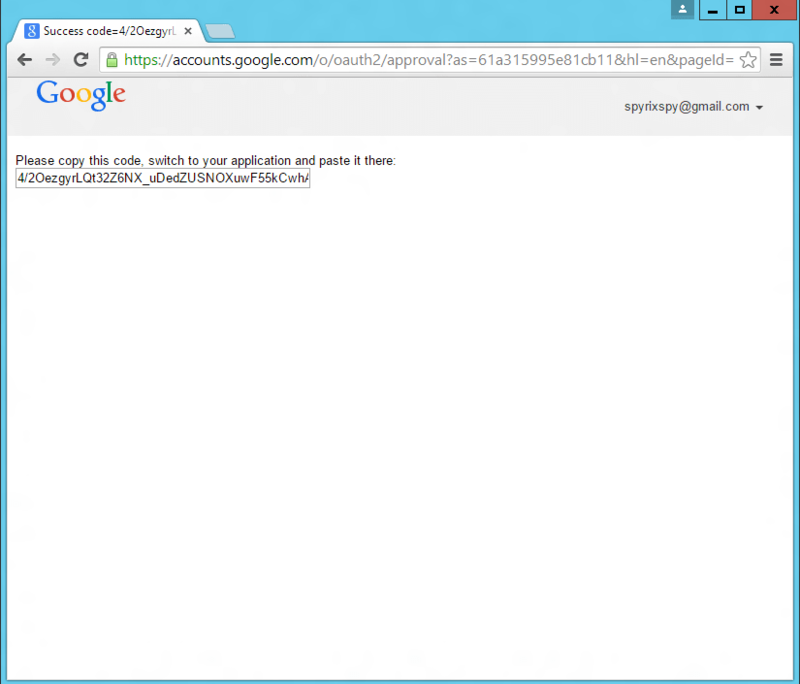 Open Google Drive. 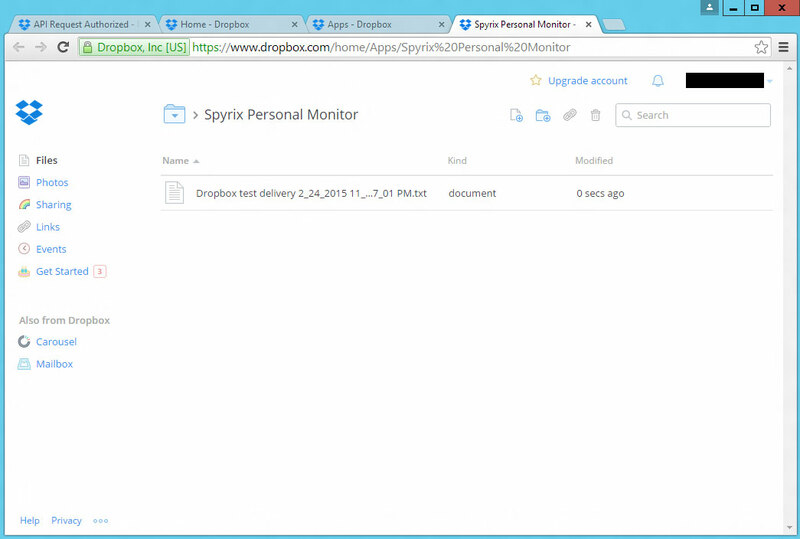 We see that Spyrix Personal Monitor folder appeared. 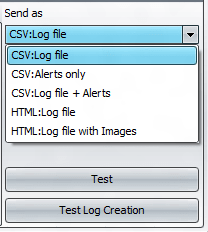 Logs from the program will be sent to this folder. Open the folder and see our first test log. This message means that you’ve done everything correctly. 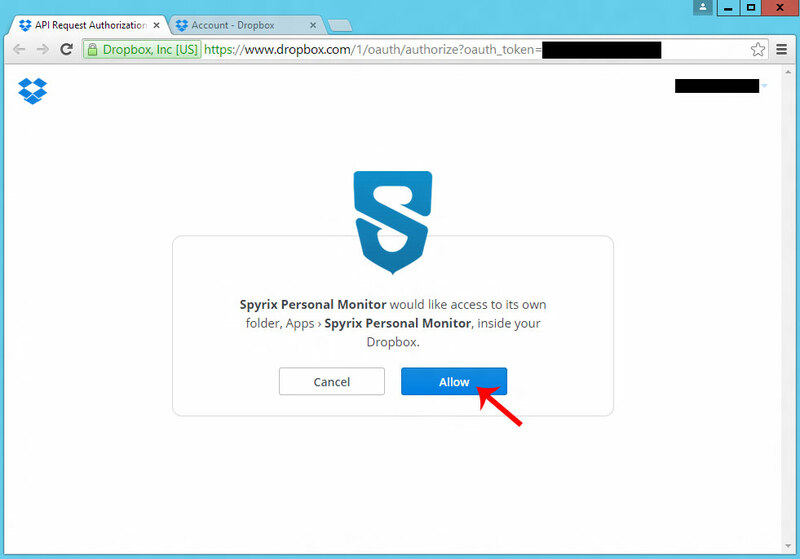 Choose Dropbox tab and place a tick near Delivery to Dropbox. 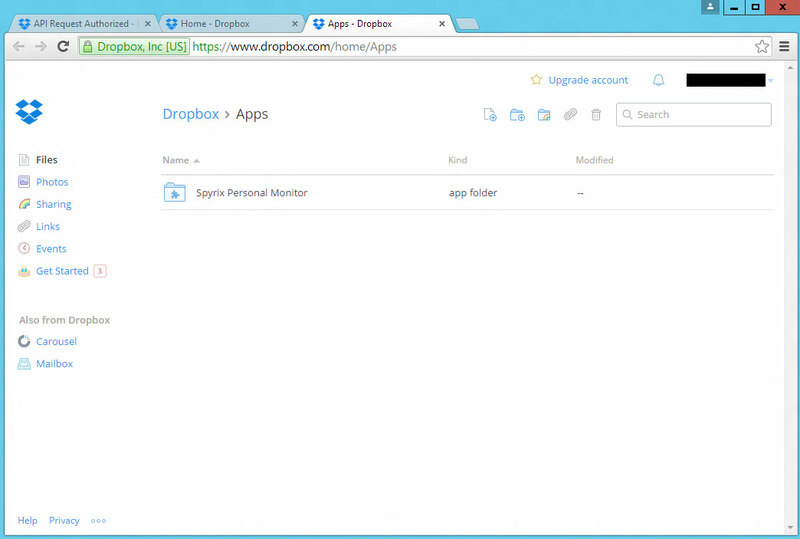 Then you can open “Apps” folder in your Dropbox account. 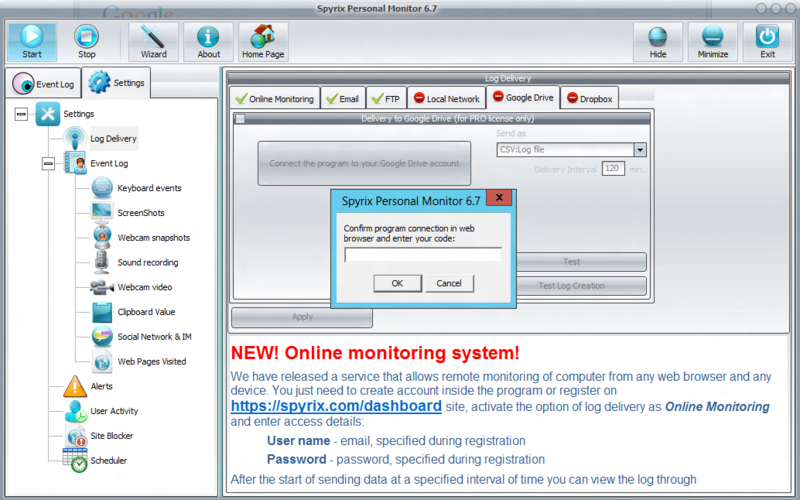 You will see “Spyrix Personal Monitor” folder there.